I love pretty much anything with mushroom sauce. When we were kids many of my favorite comfort foods involved foods smothered in mushroom gravy. Now that my Mom is living in my house and can no longer cook for herself, I am always looking for ways to make comfort foods for her but in a healthier way. 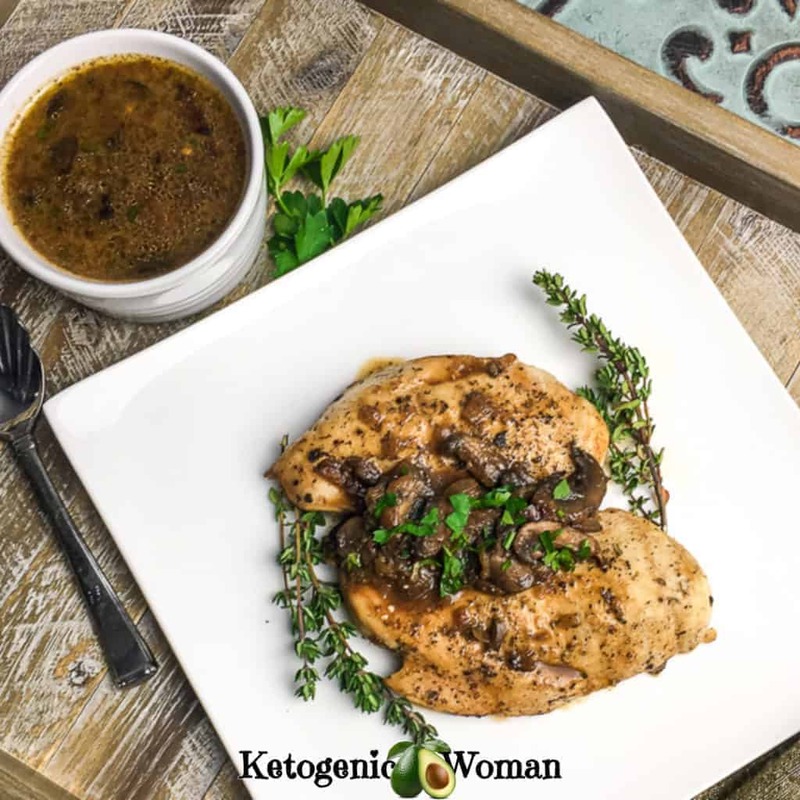 This one pot low carb Chicken Breasts with Mushroom Sauce and Goat cheese recipe is a skinny version of something she used to make. My Mom would have served this recipe over mashed potatoes but to keep it keto we use mashed cauliflower puree. How to make chicken breasts tender, moist and juicy! I used to avoid skinless chicken breasts because frankly, I find them too dry. First, we wanted to keep it healthy by using skinless chicken breasts so we covered them in mushroom sauce made with only the juices. Then we elevated the flavors with the addition of fresh herbs and made it creamy by adding some goat cheese. But it’s the Instant Pot (one of my most favorite kitchen tools ever!) that makes the whole dish tender, juicy and succulent. That’s one of my favorite things about the Instant Pot. It’s not just a time saver. I love how tender even a dry low fat cut of meat turns out. It’s a bit of magic! To pound the chicken breasts, use the smooth side of a kitchen mallet. If you don’t have one, you can use a rolling pin or anything heavy with smooth edges. Place wax paper or cling wrap over the chicken before pounding. I keep 1 cup portions of home made chicken broth in my freezer. Learn to make and store your own chicken broth here. I am lucky that I have a an assortment of herbs growing in my back yard. If you cannot get fresh herbs, you can substitute dry herbs. A general rule of thumb is to use 1/3 the amount of dry herbs. So if a recipe calls for 1 tbsp fresh, use 1 teaspoon dry. These are amazing served over top of mashed cauliflower puree. Get my recipe for mashed cauliflower here. Add one tablespoon olive oil to Instant Pot® and select the Sauté function. Set to high and once the display reads “hot,” add red onion and mushrooms. Cook, stirring frequently, until onions and mushrooms soften, about 5-6 minutes. Transfer them to a bowl and set aside. Add another tablespoon olive oil to unit and season chicken breasts with salt and black pepper on both sides. Working in batches, if necessary, add chicken to the Instant Pot® without overcrowding. Brown on both sides, approximately 2-3 minutes per side. Serve immediately with some of the mushroom sauce spooned over each chicken breast. Enjoy!. 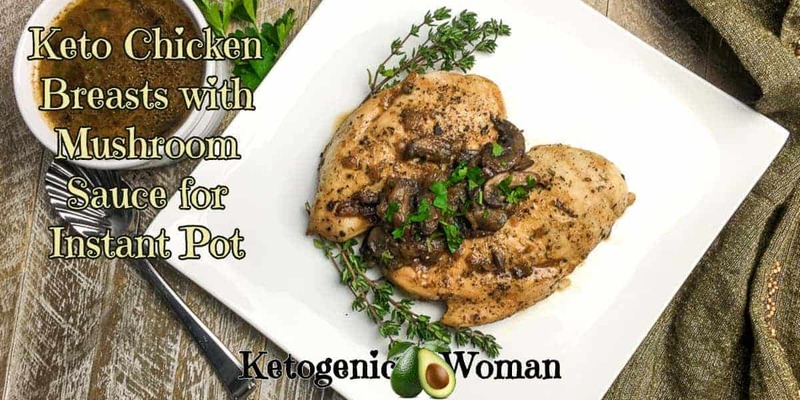 Tagged instant pot recipes, keto chicken recipe. Bookmark the permalink.